In today’s article we consider 5 surprises for 2017, covering: macro shocks, Asian LNG demand, asset transactions, capacity markets and gas supply flexibility. Our list of surprises for 2016 focused on changing energy market price dynamics. In Q1 2016, cyclically depressed conditions in a number of markets suggested the risk of major changes in energy pricing trends as the year progressed. We focused on oil, German power, European spark spreads and trans-Atlantic LNG price spreads (see here for an end of year status update on these surprises). Cyclical extremes and pricing inflection points are particularly interesting because they often coincide with extremes in the mispricing of asset values and asset risks. Many energy markets look to have formed multi-year cyclical lows in Q1/Q2 2016. But prices recovered sharply in the second half of the year, returning markets to a more balanced state. So this year we cast the net a little wider. Coming into 2017, surprise risk looks to be skewed more towards political and policy shifts. An important transition appears to be underway globally. Austerity and monetary easing have been two of the dominant economic policy response mechanisms since the financial crisis. But support for these mechanisms appears to be weakening, particularly given a rise in populist politics. There appears to be a policy shift underway towards national self-interest and higher fiscal spending to reflate economic growth. This is most obvious in the US under Trump, but is becoming a more prominent trend in European countries also. The success, or otherwise, of this policy transition will have an important impact on economic growth, inflation, interest rates, exchange rates and commodity prices, all of which are important macro drivers of energy markets. Against this backdrop we set out 5 potential surprises to consider below. The first surprise considers some larger ‘macro’ risks that could have an important knock-on impact on energy markets. Then the next four are specific surprises that relate to European power and gas markets. There were a number of big political shocks in 2016: Brexit, Trump’s election victory and the Italian referendum and resignation of Renzi. All of these represented a rapidly rising discomfort with incumbent political leadership and a shift towards new populist candidates. The impact of these shocks has only just started to play out. Political uncertainty remains unusually high in 2017 with key elections in France, Germany, Netherlands and Italy. A populist shift in any of these countries has the potential to reshape the European political landscape. This could also result in a sharp weakening in the Euro. The other important transition that appears to be taking place in a number of key economies, is a return to a rising inflation and rising interest rate environment for the first time since 2008. Inflation in several European countries has picked up over the last few months, albeit from very low levels. German inflation may breach the 2% ECB target range this month, driven by rising energy prices. UK inflation is also rising towards 2%, helped by a weaker pound. 2017 could see an upside surprise for both inflation and interest rates, both of which may be commencing a long term recovery from historically low levels. 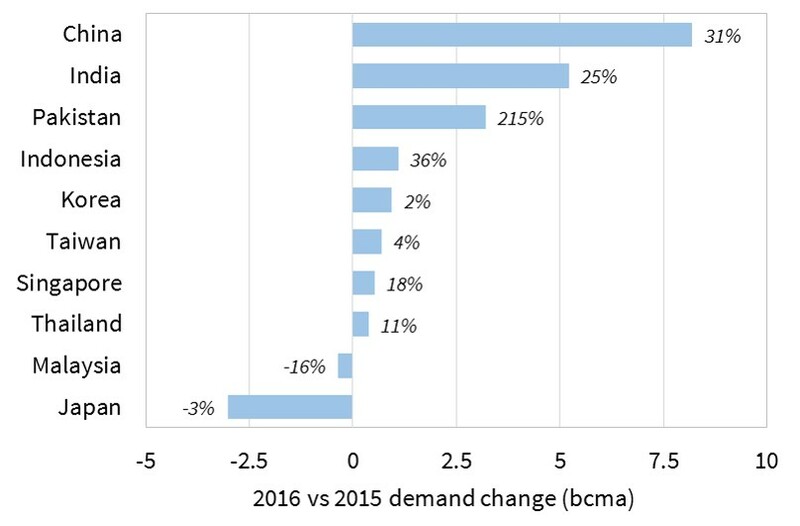 Annual Asian LNG demand fell in 2015 for the first time ever, despite rapidly declining LNG prices. This sent shockwaves through the LNG industry which was banking on robust Asian demand growth to absorb the output from huge investments in new liquefaction capacity. 2016 saw a significant recovery in annual Asian LNG demand as shown in Chart 1. Increasing demand was driven by China, India and Pakistan, offsetting a further decline in Japanese demand. However, even at the end of 2016, total Asian LNG demand remains below the 2014 level. These factors could mean Asian LNG demand growth in 2017 surprises to the upside. But even aggressive Asian demand growth recovery is unlikely to reverse the looming supply glut, given the scale of new supply coming online by 2020. It may however mean that Asia plays a more important role in absorbing that glut. Conditions that support growth in mergers & acquisition (M&A) in European power and gas markets have been building for several years. On the sell side, utilities and producers have written down more than €100 bn in asset values since 2010. Tens of billions of euros of European power and gas assets have been earmarked for sale to shore up balance sheets. Infrastructure and private equity funds dominate the buy side, alongside interest from some large Asian investors. Power and gas infrastructure is an increasingly attractive acquisition target for these investors. Cash balances are relatively high and financing flexibility has improved. European currency depreciation against the dollar is also helping, particularly a more than 20% post-Brexit fall in GBP (vs the USD). After much anticipation over the last two to three years, 2017 may be the year that transaction volumes really jump, causing some major restructuring of European asset ownership. The UK government has been focused on power market security of supply for the last five years. But direct action on security of supply has been a lower priority in Continental power markets. Different capacity support mechanisms are being designed and discussed, but aside from France who introduced a new capacity market in 2016, implementation has been slow given a perceived structural oversupply of capacity. Capacity tightness has come racing back into focus across the current winter. Capacity shortfalls in France relating to nuclear outages have sent power prices into triple figures (> 100 €/MWh). Increasing interconnection and renewables penetration are supporting a knock on effect in neighbouring markets. Periods of high net system demand have seen markets such as France, the UK and Belgium fighting for access to flexible generation output. The events of this winter are likely to drive an increased policy focus on support measures for flexible generation capacity. 2017 may be the year that planning and talking about capacity support are replaced by a leap toward implementation. A recovery in supply flexibility value is partly a cyclical story. Price signals have been weak for 6 or 7 years, choking off investment in new flexible supply infrastructure and causing the closure of some existing assets. Spot gas price volatility levels above 150% were commonplace last decade. But spot volatility at European gas hubs has hovered around 50% for most of this decade. Volatility started to recover in 2016 and could accelerate further in 2017. There are several specific issues that could bite this year. As European LNG imports increase this year with global supply volumes, hub prices may be buffeted by the ebb and flow of chunky cargo volumes, increasing the requirement for supply flexibility. A cloud also remains over two of Europe’s key flexible supply assets. Further reductions in flexibility from the UK’s Rough storage facility or the Dutch Groningen field may help support the value of supply flexibility. The aim of these surprises is not to deliver specific trade or investment ideas, although they hopefully provide some food for thought. Instead the surprises are intended to provide a reasonable challenge to prevailing industry consensus views. They are areas to consider when formulating commercial and risk management strategies in 2017. We will return again at the end of the year for a status check.